A meatless dish? Yes! When Chris heated some leftovers up at work a few of his coworkers got curious, they liked what they smelt! 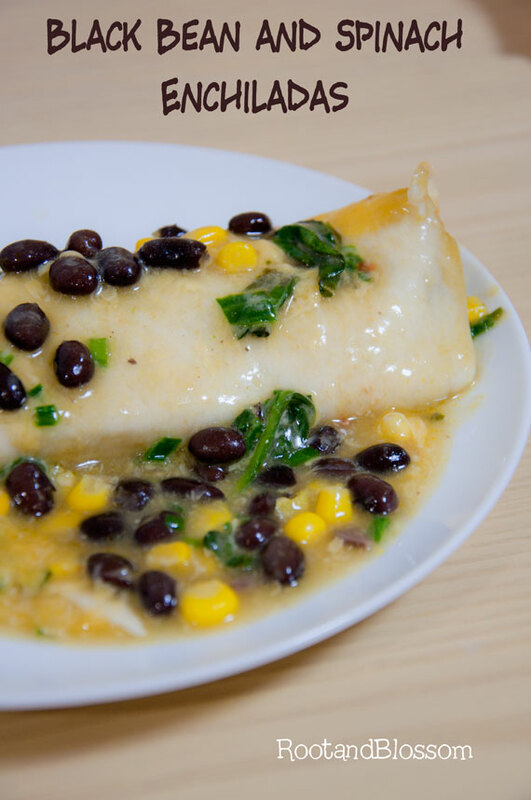 When Chris told them that it was actually enchiladas with black beans, spinach and corn they couldn't believe it. Saute spinach in a dab of olive oil until slightly wilted. In a large bowl combine the beans, 1 3/4 cups cheese, spinach, corn, green onion, cumin and red pepper flakes. Preheat the oven to 350'f. Lightly spray an 8"x8" baking dish with cooking spray. Fill a pie dish (or another tall walled dish) with one can of the enchilada sauce. Place a single tortilla into the sauce moving it around to make sure the bottom is entirely coated; flip over tortilla and coat that side as well. Move tortilla to baking dish, generously fill tortilla with mixture, roll up tightly and place seam down in dish with tortilla pushed up against one side. Repeat same sauce and mixture procedure with the following tortilla and place rolled tortilla tightly up against the first. Continue with these steps until dish is full. If you run out of sauce in pie dish open up the second can. Sprinkle all leftover mixture on top of enchiladas and pour remaining sauce evenly over the enchiladas. Sprinkling with remaining cheese. Bake covered for 20 minutes. Uncover and bake for 10 more.